A Polar Bear cub knows that the protection of its mother is very important and will stay close if feeling threatened in anyway. The mother hovers over her cub as this is its first time seeing human faces staring at it from the windows of a Tundra Buggy tour along the shores of the Hudson Bay in Churchill, Manitoba. 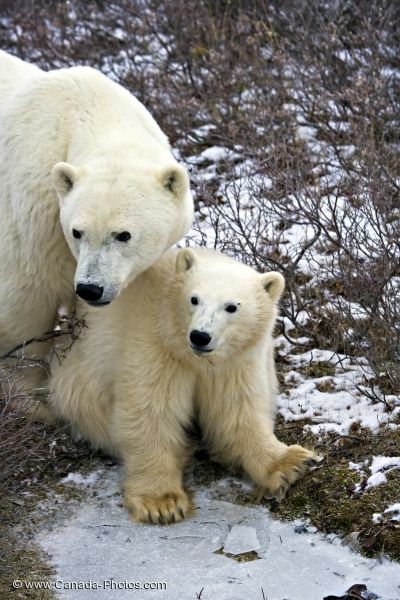 While the mother tends to her cub, one should never forget as cute as this looks, polar bears are extremely large animals and can be very dangerous. This eleven month old cub will feed from its mother's milk until it reaches 2 or 3 years old, but all the while learning how to eat and kill solid food. Polar Bear, Ursus maritimus, sow and cub in the Churchill Wildlife Management Area, Hudson Bay, Churchill, Manitoba, Canada. Picture of the protection shown by a mother Polar Bear along the Hudson Bay in Churchill, Manitoba.